Today my github streak looks like below, well this should have happened 210 days before if I were to have a good internet connection on my vacation in the Andamans. I have open sourced about 474 projects so far (i.e is from 2008), some are tiny and some are decently large. I have been part of larger of projects like yeoman koajs git-extars and other orgs as well. I don't have the exact count of humans who have crossed the 365 days mark, but I have come across couple of dozens who have and each of them would have their own experiences, given the geo location and the projects they have worked on. Let me start with related FAQs and few picks from my AMA and then will try to share my learning from it. What is the graph all about? 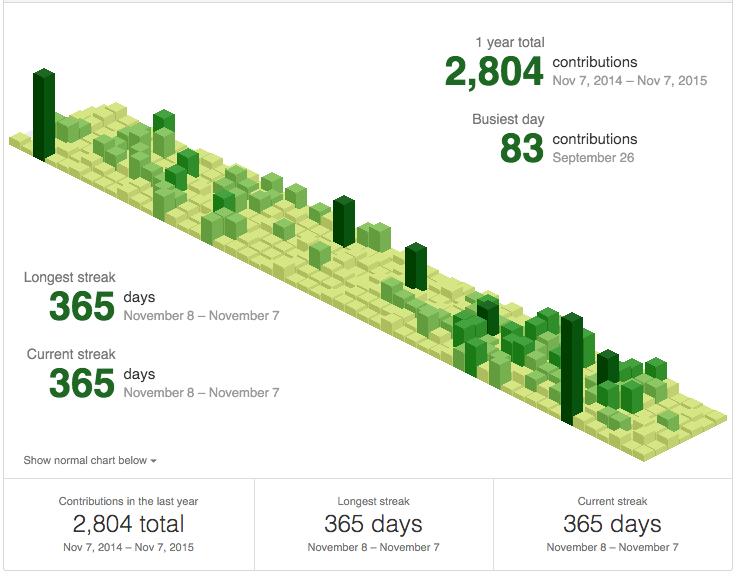 A profile contributions graph is a record of contributions you've made to GitHub repositories. Issues and pull requests opened within the last year on a standalone repository. All the commits made within the last year. Yes, a bot could help you to fake a streak but it's even more easier to find if it's faked or it's a genuine effort. How do you get time to commit? Nothing, but the below feeling! Don't get anxious it's just a streak. Start as many as projects/orgs you can, collaborate with humans and contribute more! It took about 180 days for this to become a part of life. Make new mistakes, make them in public out and loud, that is one of the finest ways to learn. Accept negative criticism with a smile. Accept and work on all the positive criticism. Pause and reflect at times. Make a public list of TODO items, so that people will help you with it and you will be cautious about them. Make sure your projects have good readme! Make meta repos for ideating if needed. Invite friends to collaborate, get people started with FOSS. Names of the repos matter a lot! Specially if it's a node module, ruby gems or similar. Don't wait for permission of others to send a PR or start an org. Thank people who helped you, out loud. Sometimes whatever you do need not be a success story, it's not meant to be as well, do it for the fun of it! Pickup new stuff now and then, experiment a lot! Well, this is all I can think of for now, I am sure I would have missed many points here, will update as and when I get more learning from this habit.